ClimateCare is delighted to win Environmental Finance’s Carbon Finance Transaction of the Year award, for a project that is kick-starting a new market for clean burning ethanol cookers that save lives and help tackle climate change. The award acknowledges its pioneering Revolving Fund model, something ClimateCare believes will act as a blue print for financing sustainable development projects around the world. In Kenya, 68% of household, primary energy still comes from woody biomass. The majority of this is burnt on smoky open fires and inefficient cooking stoves leading to air pollution and contributing to climate change. Demand for wood fuel also leads to deforestation, devastates biodiversity, reduces habitat for endangered species and reduces carbon uptake by forests. Photo caption: Judith Awino sells ethanol fuel in Kibera. This distribution chain for fuel creates jobs and as the market commercialises will be part of the value chain that makes the programme financially sustainable over the longer term. 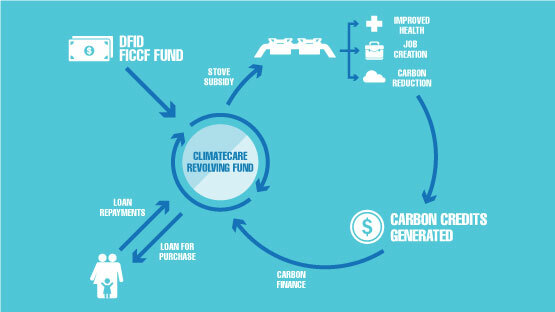 Picture Caption: ClimateCare’s Revolving Fund model. UK Department for International Development – The Department for International Development (DFID) is leading the UK Government’s fight against poverty. Through its Climate Change programme, it contributes to the overall UK International Climate Fund (ICF) objectives on low carbon and climate resilient development. Safi International – a bioethanol stove and fuel company, designing, developing and manufacturing modern bioethanol cookers.